Prices - 5 Dogs Fishing, LLC. Professional five star service every drift. Four hours of fishing and floating the Upper 7 miles of the Kenai River. Great for the kids and adults looking to get on the water and catch a few trout and dollies, take a picture, and put them back. If the Sockeye Salmon are really running you might even sink a hook into one! 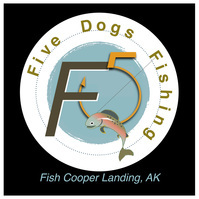 These trips float the “Upper Upper” or first seven miles of the Kenai River. This is a fun stretch of river with lots to offer, good for fishing from the drift boat and a few good bank fishing zones to catch Sockeye. We have been guiding this piece for years and call it home. These trips can occur on any part of the Kenai River, Canyon, Middle, etc. ; wherever we feel will suit you best. Count on some drive-time being involved. With very limited incidental Kenai National Wildlife Refuge (KNWR) starts, contact us early if you are at all interested in fishing the KNWR. We are flexible to your needs and want to accommodate you. If someone in your party is not interested in fishing but would like to join for the float, they may be added to any of the above trips for the scenic price of $150. The boat is booked until all four seats are filled unless the private option is booked. All fishing guests must have a valid Alaska fishing license which will be checked the day of the trip. Click on the Resources page for a link to get your Alaska fishing license. Departure times and location will be set according to the trip and species of fish selected. Checks, cash, and major credit cards accepted. Call us for more information and to place deposit of $100 if you would like to book. Deposits are non-refundable within 15 days of your scheduled trip date.